Before her presentation “The Evolution of ISIL” at 49th State, we invite you to attend an intimate coffee chat at Kaladi Brothers with Dr. Karin von Hippel. 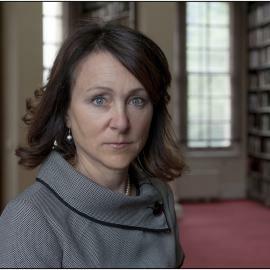 Karin von Hippel joined RUSI after serving for nearly six years in the US Department of State as a Senior Adviser in the Bureau of Counterterrorism, then as a Deputy Assistant Secretary in the Bureau of Conflict and Stabilization Operations, and finally, as Chief of Staff to General John Allen, Special Presidential Envoy for the Global Coalition to Counter-ISIL. Prior to that, she co-directed the Post-Conflict Reconstruction Project at the Center for Strategic and International Studies in Washington, DC and was a senior research fellow at the Centre for Defence Studies, King’s College London. She has also worked for the United Nations and the European Union in Somalia and Kosovo, and has direct experience in over two dozen conflict zones. Dr von Hippel has numerous publications to her name, including Democracy by Force: US Military Intervention in the Post-Cold War World (2000), which was short-listed for the RUSI Westminster Medal in Military History. She holds a PhD from the London School of Economics, an MSt from Oxford University, and a BA from Yale University.